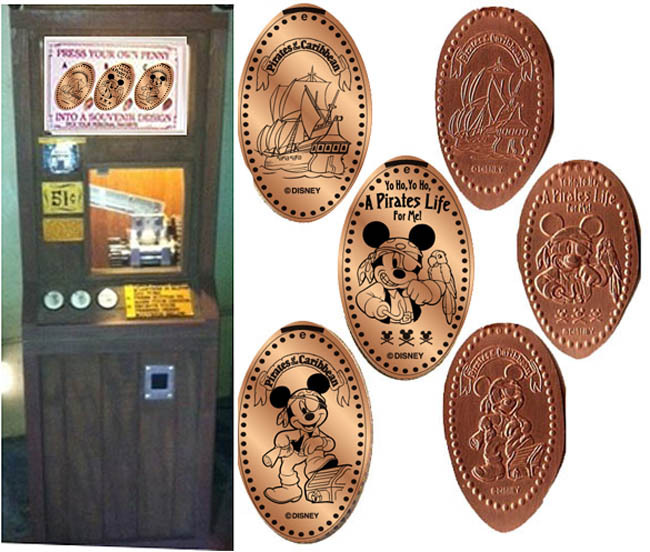 The new electronic machines with 8 designs are $1 per penny or $5 for all 8. 1) Standing Woody, 2) Cowboy Donald with noose around his neck, 3) Cowboy Mickey. 1) Cinderella’s Castle over Magic Kingdom banner, 2) Mickey standing in Tuxedo, 3) Minnie standing holding purse. 1) Mickey driving Steam Train (Facing forward Out right side), 2) Steamboat Willie, 3) ‘Main Street USA’ with Mickey & Minnie in old car. 1) Robot, 2) Buzz pointing up, Aliens around, 3) Buzz standing pointing left, 4) Buzz flying right, 5) Alien, 6) Spaceship, 7) Buzz with fist up flying forward, 8) Zurg. 2) 8 Design machine: Astronaut Mickey, Astronaut Goofy, Astronaut Donald, Astronaut Minnie, Astronaut Buzz with Alien in Ride Car, Astronaut Pluto, Stitch in ride car, Mister Incredible in ride car with friend. 1) Mickey in Astronaut suit in front of Space mountain, 2) Mickey, Donald and Goofy in ride car going down in front of Space Mountain, 3) Astronaut Mickey floating above Space Mountain, 4) Mickey in ride car heading away from Space Mountain. 1) X-Wing fighter, 2) Tie Fignter, 3) Star Wars logo, 4) Darth Vader, 5) Luke Skywalker, 6) Storm Trooper, 7) R2D2, 8) Millenniun Falcon. 1) Pluto with cup trophy, 2) Minnie in race car, 3) Mickey with checkard flag, 4) Mickey in race car. 6) Retired Main Street Emporium #1; Cinderella’s Castle floating on a cloud. 1) Retired Tomorrowland Indy Speedway (2015); 1) Mechanic Goofy, 2) Speedway Logo with Mickey in race car, 3) Indy Speedway Logo, 4) Mickey standing giving the thumb’s up sigh right of the winner’s cup. 1/16: The Tomorrowland Indy Speedway machine is retired.